What does it do? In addition to a pleasurable taste, extra virgin olive oil has potential health benefits including reduced risk of coronary heart disease, reduced risk of breast and colorectal cancers, and improved blood sugar control (See What It Does). Some of these benefits are associated with high amounts of polyphenols in extra virgin olive oils, as well as high concentrations of oleic acid. How much to take? Health benefits with extra virgin olive oil have been associated with intakes of about 2 to 4 tablespoons per day -- particularly when this replaces saturated fats (See What It Does). Best choice? Although all ten of the popular extra virgin olive oils selected for review by ConsumerLab.com passed chemical testing, analysis of flavor and aroma by an expert olive oil taster raised questions about the quality of three products — grading them as not extra virgin (See What CL Found). Among those considered "Extra Virgin," CL selected three as its Top Picks — having correct chemistry, excellent flavor and aroma, a high concentration of polyphenols and oleic acid, and low cost. Use the Results Table to compare the test results (including polyphenol levels, which ranged from 215 mg/kg to 369 mg/kg -- a 72% difference! ), taste descriptions, prices, and other features of products. How to buy, use, and store? Buy olive oil in a dark-colored bottle to protect it from light (and/or store it in a dark cabinet), and don't worry about the color of the oil — it's not a reliable indicator of quality or flavor. If cooking with olive oil, limit use to later stages of cooking, keeping heating time to a minimum (See ConsumerTips for Buying and Using). Cautions: Olive oil is generally safe and well-tolerated, but it may interact with certain medications (see Concerns and Cautions). "Virgin" olive oil is oil which has been removed from the olive only by mechanical (e.g., pressing) or other physical means (e.g., heating) that do not lead to alterations in the oil. "Extra virgin" olive oil (which we refer to in this report as EVOO) is a virgin olive oil which, according USDA standards, "has excellent flavor and odor" (i.e., zero defects and some fruitiness), while "virgin" olive oil is permitted some sensory defects as well as a higher level of acidity (free fatty acids). Both must meet similar chemical requirements indicating the olive oil has not been adulterated with other oils, been misprocessed, and is not spoiled (see Quality Concerns and What CL Tested For). Olive oil is high in monounsaturated "healthy" fats (due to its high concentration of oleic acid) and, depending on the oil, may be rich in antioxidant polyphenols. Olive oil can help lower blood pressure, improve cholesterol levels and control insulin levels in the body. It may also reduce the risk of certain types of cancer. "Limited and not conclusive scientific evidence suggests that eating about 2 tablespoons (23 grams) of olive oil daily may reduce the risk of coronary heart disease due to the monounsaturated fat in olive oil. To achieve this possible benefit, olive oil is to replace a similar amount of saturated fat and not increase the total number of calories you eat in a day" (FDA 2004). For example, one observational study found that the risk of heart attack in men and women was 82% lower for those who regularly consumed about 4 tablespoons of olive oil per day, compared to those who consumed less than a half tablespoon per day (Fernandez-Jarne Int J Epidemiol 2002). Another observational study, which followed over 2,000 Greek men and women (average age 50) without pre-existing cardiovascular disease for an average of eight years, found that those who reported exclusively using olive oil as the source of fat/oil in their diets at the beginning of the study had a 93% lower risk of having a cardiovascular disease event during the study compared to those who did not consume any olive oil. There was no risk reduction among those using a mixture of olive and other oils (Kouli, Eur J Nutr 2017). In a large study of men and women at high risk for cardiovascular disease, those who consumed a Mediterranean diet supplemented with 4 or more tablespoons of extra-virgin olive oil per day had a 30% lower risk heart attack, stroke or dying of heart disease after five years compared to a control group who consumed a similar diet (but which was somewhat lower in fat) and who were discouraged from consuming more than 2 tablespoons of olive oil per day (Estruch, N Engl J Med 2013). This study was retracted due to a sampling error but when reanalyzed and republished, the main conclusions remained the same (Estruch, N Engl J Med 2018). A small, 6-month study among men and women with mild to moderate high blood pressure found that those who consumed several tablespoons of olive oil (4 tablespoons for men, 3 tablespoons for women) and slightly reduced their intake of saturated fat were able to reduce their dosage of blood pressure lowering medication by 48% compared to those who instead, consumed safflower oil (Ferrara, JAMA Int Med 2000). Research suggests that olive oil containing higher amounts of antioxidant polyphenols may be more effective in improving cholesterol levels than olive oil with lower amounts of polyphenols. An analysis of 26 clinical trials conducted in Europe, Greece and Jordan found that, compared to consuming olive oil low in polyphenols (0 mg/kg to 132 mg/kg), consuming olive oil higher in polyphenols (150 mg/kg to 800 mg/kg) decreased average total cholesterol and "bad" oxidized LDL cholesterol by 4.47 mg/dL and 0.44 mmol/L, respectively, and increased average "good" HDL cholesterol by 2.27 mg/dL. There was no effect on triglycerides nor overall LDL cholesterol. In the studies, which lasted three weeks to three months, the most common daily dose of olive oil was 25 mL (a little less than two tablespoons); about half the participants were healthy, while the other half included individuals at increased risk of heart disease (George, Crit Rev Food Sci Nutr 2018). Generally, extra virgin oils contain the highest concentrations of polyphenols -- about 100 ppm to as much as 500 ppm (Garcia, Eur Food Res Technol 2003), although oils with levels of about 400 or higher may be very bitter (Agbiolab). A 3-month study in which extra virgin olive oil (25 mL, or about 5 teaspoonfuls, per day) was substituted for other cooking oils in a typical American diet in obese older adults in Boston found that it reduced blood pressure (systolic blood pressure decreased 6 mmHg on average) and tended to increase HDL "good" cholesterol. In addition, increased oleic acid levels in the blood were found to be associated with increases in IL-2 production (suggesting improved immune function, although not an anti-inflammatory effect) (Rozati, Nutr Metab (Lond) 2015). Substituting extra virgin olive oil for soybean oil while dieting resulted in greater losses of fat in a study of overweight and obese women in their late 20s in Brazil. The women consumed an energy-restricted (reduced calorie) but normal fat diet that included a milk-based breakfast drink containing either 25 ml (about 2 tablespoons) of soybean oil or extra virgin olive oil. After nine weeks, women in the olive oil group had lost significantly more fat than those in the soybean oil group (5.3 lbs vs. 2.9 lbs). The olive oil group also lost more total weight than the soybean oil group (6.1 lbs vs. 3.7 lbs ), but this difference was not statistically significant. Systolic blood pressure decreased by nearly 4 mmHg in both groups but diastolic blood pressure decreased only in the olive oil group (by 5 mmHg). (Candido, Eur J Nutr 2017). A study of postmenopausal women in Spain found that eating a Mediterranean diet supplemented with olive oil (extra virgin; 1 liter per week for each woman and her family) for about 5 years was associated with a relatively lower risk of breast cancer (1.1 cases per thousand women) in comparison to women who only advised to follow a low fat diet (2.9 cases per thousand). Eating a Mediterranean diet supplemented with mixed nuts (30 grams per day) also showed some risk reduction (1.8 cases per thousand women), but, unlike with olive oil, this was not statistically significant (Toledo, JAMA Int Med 2015). Similarly, another Spanish study found that close adherence to a Mediterranean diet consisting of olive oil, fruits, vegetables, fish and legumes (beans) was associated with approximately a one-third lower risk of aggressive prostate cancer than poor adherence to such a diet. There was no such risk reduction with close adherence to either a "Prudent" diet high in low-fat dairy, vegetables, fruits, low, whole grains, and juices, or a "Western" diet high in red or processed meats, energy dense (high calorie) foods, and sometimes elevated intakes of eggs and refined grains (Castello, J Urol 2017). Observational studies have also found an association between higher olive oil intake and a reduced risk of colorectal cancer; it is has been proposed that olive oil might slow the process of healthy intestinal tissue from becoming cancerous, although this remains only a theory (Stoneham, J Epidemiol Community Health 2000; Pampaloni, Nutr Cancer 2014; Braga, Cancer 1998). Compared to the use of saturated fats, the oleic acid in olive oil seems to improve insulin sensitivity and lower blood sugar levels in healthy people and in those with high triglyceride levels (Bermudez, Food Funct 2014). A study among people with pre-diabetes found that including 10 grams (1 tablespoon) of extra virgin olive oil in a meal resulted, two hours later, in blood sugar levels rising less than half as much as when a similar meal was consumed that didn't include olive oil; in addition, insulin levels rose about twice as much and triglycerides remained stable rather than rising. The researchers noted that adding a small amount of extra virgin olive oil to a meal "may represent a simple, cheap, and safe approach to limit the deleterious effects of post-prandial hyperglycemia and hyperlipidemia in patients with impaired fasting glucose" (Carnevale, Clin Nutr 2017). Similarly, as noted below, olive oil can help prevent the development of type 2 diabetes and improve blood sugar control in people with type 1 and type 2 diabetes. A review of 33 observational and clinical trials among adults in the U.S, Europe, Australia and Asia found that consuming between 15 to 20 grams (about 1 ½ to 2 tablespoons) daily of olive oil (all types, including extra virgin) reduced the risk of developing type 2 diabetes by 13%. Consuming more did not further reduce the risk. In addition, among people who already had type 2 diabetes, consuming olive oil was associated with decreases in fasting blood sugar (average decrease -0.44 mmol/L ) and HbA1c when compared to the effects of low-fat diets, although it was no better than consuming fish oil or diets rich in polyunsaturated fats such as safflower, sunflower, or soybean oil (Schwingshackl, Nutr Diabetes 2017). Beneficial effects of olive oil on blood sugar have also been shown in people with type 1 diabetes. A study among 13 men and women with type 1 diabetes on insulin pumps found that adding 37 grams (about 3.5 tablespoons) of extra virgin olive oil to a high-glycemic meal (including white rice and white bread) resulted, over the next 3 hours, in blood glucose levels which were just half that which occurred when butter was substituted for the olive oil. Interestingly, reducing the amount of extra virgin olive oil to just 10 grams resulted in a similar blood glucose level as found with the butter — although, over the next few hours, glucose levels returned to pre-meal levels, while they remained elevated in the group which consumed butter. There was no significant benefit with olive oil when the experiment was done with a low-glycemic meal (Bozzetto, Diabetes Care 2016). An analysis among older men and women (ages 55-80) in Spain with a high risk for cardiovascular disease who, as part of a larger study consumed either a Mediterranean diet enriched with olive oil or mixed nuts, or a traditional low-fat diet found that, during the 5-year study and a 9-year follow-up period, those who consumed the most extra virgin olive oil (about 4 tablespoons per day) had a 51% lower risk of osteoporosis-related fractures compared to those who consumed the least extra virgin olive oil (about 1.5 tablespoons per day) after adjusting for potential confounders (Garcia-Gavilan, Clin Nutr 2017). No reduction of fracture risk was associated with other types of olive oil (refined or pomace), leading the researchers to suggest the benefit may be related to the higher polyphenol content of extra virgin olive oil. Freshly pressed extra virgin olive oil contains a compound called oleocanthal which has been shown in laboratory experiments to have an anti-inflammatory effect similar to ibuprofen, through the inhibition of Cox-1 and Cox-2 enzymes (Beauchamp, Nature 2005). However, because the amount of oleocanthal in olive oil is quite small, it would be difficult to consume enough extra virgin olive oil to provide similar pain relief. In fact, it has been calculated that even 3 1/2 tablespoons of extra virgin olive oil might only have 10% of the effect of a normal dose of ibuprofen (Parkinson, Int J Mol Sci 2014). A study among 56 men and women (average age 40) diagnosed with major depression (most of whom were receiving therapy and/or anti-depressant medication) who had a poor-quality diet (low in dietary fiber, lean meats, fruits and vegetables and high intake of sweets) investigated the effects of a Mediterranean diet with olive oil on depression. It found that, compared to a control group who participated in a weekly social support group but maintained their typical poor-quality diet, those who consumed a Mediterranean diet (whole grains, lean meats, eggs, fruits, nuts and vegetables + 3 tablespoons of olive oil per day) for 3 months had significant decreases in self-reported symptoms of depression. After 3 months, 32% of those who consumed the Mediterranean diet no longer met the criteria for depression (average 11-point decrease in depression symptoms) while just 8% of those in the control group experienced remission (average 4-point decrease in depression symptoms) (Jacka, BMC Medicine 2017). Laboratory evidence suggests olive oil may increase testosterone levels by influencing enzymes involved in testosterone production (Hurtado de Catalfo, Lipids 2009). One small study in young men in Morocco found that 25 mL (a little less than 2 tablespoons) of extra virgin olive oil increased blood levels of testosterone by about 17% in healthy young men when consumed daily for three weeks, however, the study lacked a placebo control and, for two weeks prior to being given olive oil, the men had, instead, consumed butter daily (Derouiche, Nat Prod Commun 2013). 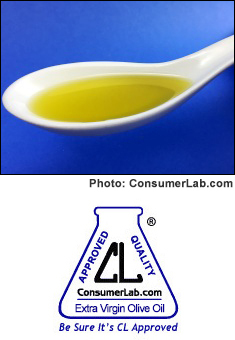 Although the USDA has established standards for EVOO and maintains a voluntary Quality Monitoring Program in which manufacturers pay a fee to have their products evaluated, no U.S. government agency is responsible for routinely testing EVOO products and there have been reports that some products are "fake" or adulterated with other types of oils (Vietina, Food Chem 2013;"Agromafia", CBS 60 Minutes 2016). A 2010 study of nineteen extra virgin olive oil brands by researchers at the University of California, Davis (UC Davis) found that 69% of imported samples and 10% of California samples tested, failed to meet sensory standards set by the International Olive Council (IOC) and the United States Department of Agriculture (USDA) (Frankel, UC Davis Olive Center 2010). Sensory defects, such as a rancid taste or musty odor, can sometimes indicate oxidation, poor quality, or adulteration with cheaper oils (often a cheaper, refined olive oil). Among the oil samples with sensory defects, chemical analyses confirmed that 86% had chemical characteristics indicative of poor quality. Although adulteration with cheaper oils such as cottonseed, soybean or sunflower has been a concern, the UC Davis researchers concluded that any adulteration detected was probably due to the addition of cheaper, lower-grade olive oil (which is often heat-treated or processed in ways not suitable for extra virgin olive oil). Free Acidity (Free Fatty Acid Content) - This is a measure of the quality of the oil, reflecting the quality of the olives used and the care taken in producing the oil. Free fatty acids should constitute no more than 0.8% of the oil (for "virgin" olive oil, the limit is 2.0%). Purity (Fatty Acid Composition) - Fatty acids are the molecular components of oil. Basic percentages of fatty acid types are expected within a certain range for olive oil, distinguishing it from seed oils which should not be present. Rancidity (Peroxide Value) - A rough indicator of the amount of primary oxidation of olive oil expressed as milliequivalents of active oxygen per kilogram of oil. The Peroxide Value must be no more than 20. A high value indicates that the olive fruit or paste was not handled properly. Olive oil with a high peroxide value many not keep well. Absorbency in Ultraviolet (UV) - Based on the absorption of two wavelengths of light to detect the formation of chemical bonds in the oil, this provides information about the quantity of oxidized oils in the product, indicating the quality of the oil, state of preservation, and changes brought about through processing. The result is expressed as "delta K," which must be no more than 0.01 and absorbency at 270 nm must be no more than 0.22 (for "virgin" olive oil the limit is 0.25). In addition, although not a USDA requirement, ConsumerLab.com determined the Polyphenol Content of each product due to its possible association with cardiovascular benefits. Polyphenols are a key antioxidant component of olive oil and results are expressed as milligram equivalent of gallic or caffeic acid per kilogram of oil. However, polyphenol content is not typically listed on labels, which is why ConsumerLab.com determined the amount in each product, as listed in the Results Table below. In the study UC Davis mentioned earlier (Frankel, US Davis Olive Center 2010), researchers also reported concentrations of polyphenols (measured as caffeic acid) in extra virgin olive oils. These ranged from 80 mg/kg to 377 mg/kg, with many in the 100 to 200 mg/kg range (Note: The study includes the list of brands tested as well amounts of polyphenols found in each). Extra virgin oils usually contain the highest levels of polyphenols, and generally, the more polyphenols an oil contains, the more bitter and "pungent" it will be (Garcia, Eur Food Res Technol 2003; Agbiolab website). If the label lists the variety of olives used, it may be helpful to know that Cornicabra, Coratina, Moraiolo and Koroneiki varieties tend to have a high polyphenol content, while varieties known to have lower polyphenol content include Arbequina, Picudo, Sevillano and Taggiasca — although levels can be affected by agricultural practices, harvest time (polyphenols decrease with ripeness), and storage time (Agbiolab website). Flavor and Odor (Aroma) - EVOO is expected to have "excellent" flavor with no defects and with positive attributes (such as olive, apple, green, sweet, grass, nutty, tomato) and no negative flavor attributes (such as fusty [due to poor storage of olives, promoting bacterial growth], winey-vinegary [due to fermentation of stored olives, producing ethanol, acetic acid, and ethyl acetate], muddy-sediment, and rancid). For a product to be deemed extra virgin by USDA standards, it must meet all of the chemical requirements noted above (excluding polyphenol content). In addition, it must meet other chemical requirements but most of these are not particular to extra virgin olive (such has having a total sterol content of at least 1,000 mg/kg, which is required of all types of olive oil) and were not included in ConsumerLab.com's analysis. The USDA also requires that the sensory analysis of flavor and aroma be conducted by a panel of testers (at least five), using the median scores from the panel. Instead, ConsumerLab.com used just one expert tester. Consequently, the results of this report cannot represent whether or not a product meets the USDA standard for extra virgin olive oil. However, the results do represent a meaningful chemical analysis of each product and an expert, subjective opinion on the aroma and flavor of each. See How Products Were Evaluated for more information on testing methods and passing scores. Extra Virgin Olive Oil Review!